NEW YORK, Feb. 1, 2019 /PRNewswire/ -- A video exhibiting the charming culture of Lanzhou City will be broadcast on the mega screen of the "Crossroads of the World" -- New York Times Square. 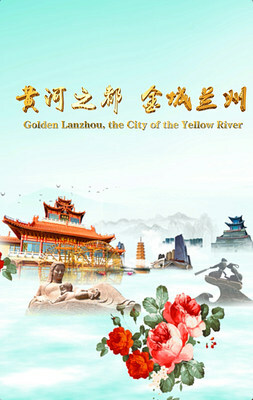 The video is produced by the News Office of Lanzhou City Government, and is titled "Golden Lanzhou, the City of the Yellow River". This is the second time that Lanzhou City has made a broadcast on Times Square. Upon the Chinese New Year, according to the tenant of the mega screen -- Xinhua Screen Media Co., Ltd., the video will be broadcasted from February 1 to 7. Lanzhou City is one of the most important cities of the Belt and Road, and is an important station of the Silk Road. Because of its special geographic location, that is, as the only provincial capital city intersected by the Yellow River, a special culture -- the Yellow River Culture -- has developed. It is notable that the video lines up Lanzhou City's landmarks -- Santai Attic, Baita Mountain, the Water Wheel, the Forest of the Steles, Zhongshan Bridge, and the Monument of the Mother Yellow River, and sequences them according to their history alongside the Yellow River banks. At the very end of the video, the scenes of the south bank of the Yellow River are visualized through hand drawings. Lanzhou City is proud to share the city's image and culture with the world at this very special time, when the People's Republic of China celebrates its 70th anniversary and embarks on its path to pursue new achievements and communicate more with the world for peace and hope. Following its nation's footsteps, Lanzhou City is trying its best to protect Oriental culture as well as develop itself. The city wishes to share the joy of its nation's 70th anniversary with people from all around the world, as well persist in traditions and innovation. Lanzhou City's video is one part of the great wish to present a happy new year to the whole world and the greater hope for peace in the world.